“It is the first time I [will] go there since the war, Qaddafi’s troops were inside and I want to know what happened,” said Fadel Ali Mohammed, Libya’s freshly appointed minister for antiquities. Setting out from the Tripoli hotel that has become his temporary home, the 62-year-old â”€ a doctor in archaeology and Greek philology â”€ begins the drive west to Sabratha, one of Libya’s most treasured archaeological sites. As Mohammed’s driver turns off the main road towards the Roman, Phoenician and Byzantine ruins, the first signs do not look good. Like many buildings along New Sabratha’s main road, a housing block near the entrance of the Unesco world heritage site has been subjected to heavy artillery fire that could obliterate a Roman relief, mosaic or fountain. Slowly Old Sabratha comes into focus. First a few Corinthian columns, then the top half of its show-stopping 1,800-year-old Roman theatre, strikingly cast against the waves of the southern Mediterranean. The security staff at the site, like many others in revolutionary Libya struggled to continue their watch during the fighting. But their reports are not as bad as feared. Despite battles raging in the area just weeks ago, it appears only one light-arms skirmish took place between Muammar Qaddafi’s troops and the fighters who would come to overthrow him. Mohammed, who in the 1970s spent a year in Qaddafi’s jails before fleeing to Greece, scans the west side of the 5,000-capacity theatre and comes across three bullet holes he says can be easily restored. The damage assessment from world-beating sites at Leptis Magna and Cyrene to the east are equally positive. With at least three of Libya’s five Unesco sites preserved, locals hope tourists will now flock to Libya like they do to neighboring Egypt and Tunisia. “It was very difficult for tourists to come under the Qaddafi regime,” said Hadi Mafuz, a Sabratha tourism official. If the tourists do flock in, it could, in part, be thanks to people like Mohammed and 46-year-old museum guard Ibrahim Hamad Saleh El-Zintani. For 13 days and nights during the fasting month of Ramadan, the father of six guarded Tripoli’s Red Fort against looters, throwing barricades of scaffolding and heavy rocks against the gates first built by the Romans and later used by the Knights of Malta. “We faced many, many difficulties. 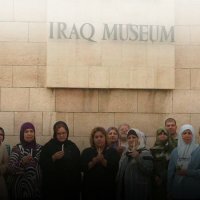 People were trying to enter the museum, they tried to steal the things but we prevented them,” he said. A neighbor brought money to his wife and children at home so they could enjoy the festivities. Inside the fort, Mohammed and the staff had already built what they hoped would be the ultimate defense, a bricked and painted false wall in one museum wing. Behind the wall lay any valuable artefact that could be carried. Only heavy statues and modern tat was on show. “We were afraid that something exactly like this would happen,” said Mohammed.